If you’ve ever thought about grabbing a bite out with the kids, one of the first things you might ask yourself is, “Does this restaurant have a playground?” As parents, we all go down the list of kid-friendly restaurants. 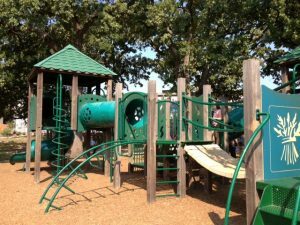 And depending on the age of your child or how active they are a playground might make your outing more enjoyable for the whole family. 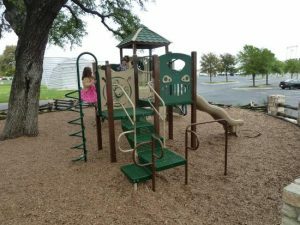 Playgrounds help keep the kids entertained while waiting for their food and off their electronics. 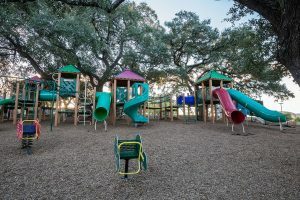 Here is a list of best restaurants in the Austin city that have playgrounds. This gourmet grocery store is a favorite to many Austin locals. It features a modern restaurant with a gelato counter, stage, patio, and a vast playground. You and your family can enjoy dinner on the patio while listening to some live music performed by some of Austin’s local musicians. The a is not enclosed but it’s right next to the patio, there is also a large field where families can play football or throw a frisbee around. There are a handful of Waterloo Ice House locations around the Austin area. 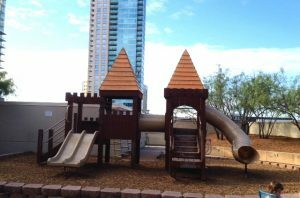 Apart from the delicious food offered, your kids will get to climb and slide on large playgrounds, some spots even have giant sandpits for kids to play in. The best thing about this restaurant is that 2 of its locations have enclosed playgrounds, so you can sit back and enjoy your meal knowing your kids are playing safely. Who doesn’t enjoy burgers and ice cream, right? Phil’s Icehouse and Amy’s Ice Cream have combined Austin’s all-time favorites in one location. Here you can grab some gourmet burgers and end your meal with the best ice cream in Austin. There is an outdoor seating area where you can enjoy your meal while you keep an eye on your kids. The only downside is this playground is not fully enclosed so keeping an close eye on small kids is suggested. The Salt Lick is one of the best places to enjoy an authentic Austin BBQ meal. Tree covered patio offers ample shade in the summer for kids playing on the playground. 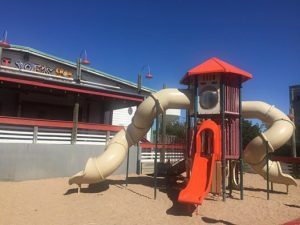 Unfortunately, this playground isn’t completely enclosed, and it is right next to a parking lot, but outside seating is available so you can keep an eye on those little ones while eating your delicious BBQ and fantastic cobbler. 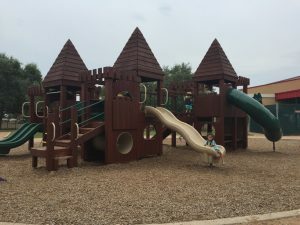 Mandolas has a few locations throughout Austin, and they all have playgrounds, unforetold not all of them are enclosed, so parental supervision is suggested for the smaller ones. They offer amazing Italian food, and kids get a free gelato with every kid’s meal you purchase. 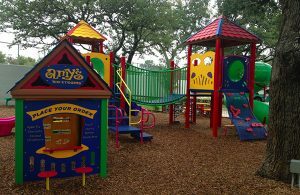 Besides being famous for their pancakes and great queso, they also have an excellent playground adjacent to the patio. Kids get to eat free every Tuesday, making the restaurant a favorite to many families. 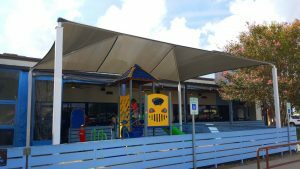 Kerby Lane offers outdoor seating just feet away from the fully enclosed playground. Whether you live in north or south Austin, you can guarantee you’ll have great food and fun at Whole Foods Market. From a large selection of incredible foods, you are sure to please everyone’s appetites. The downtown location has rooftop dining and a rooftop playground which are both enclosed. The Domain location is a bit smaller for kids, and it isn’t enclosed but does offer free kids music on the patio most Sundays. 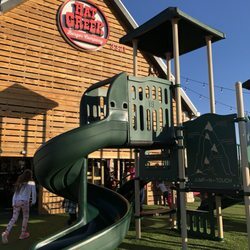 Hat Creek Burgers is one of the most successful restaurants in Austin, having five locations throughout Austin and growing. This restaurant will make you feel more like you have burgers in your backyard with friends then out at a restaurant. With a enclosed playground and outdoor seating, you are sure to be able to keep an eye on the kids. Additionally, they have family nights every Tuesday, their food is top notch and always fresh. Although this restaurant has a playground that is a bit smaller than others, it has some activities to keep the kids entertained. 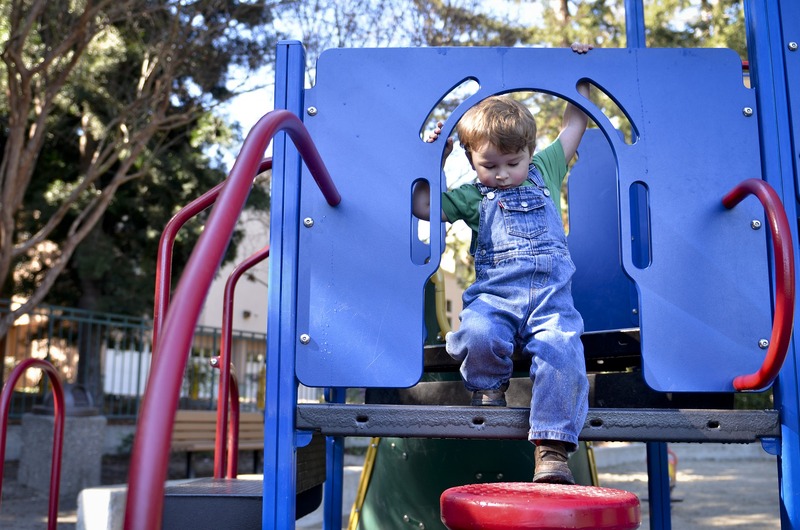 Kids can enjoy slides, outdoor toys and climbing on the metal climbing dome. There are also wooden blocks that keep little ones busy creating new towns and buildings. Seating is available next to this enclosed playground, so you can sit back and enjoy some delicious queso just feet away from your kids. 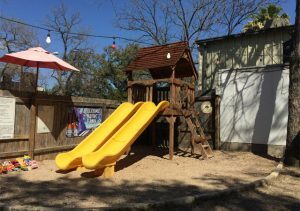 This restaurant closes our list of the ten best restaurants in Austin with a playground. If your family is in the mood for some seafood, this place has it all. This beach themed restaurant has an extensive menu to please any seafood lover and a large playground to make the kids happy. The playground is enclosed and strategically placed next to the back patio. With slides and sand to play in, your children will surely have a blast. Austin is an excellent place to live. Apart from these restaurants having playgrounds, you can be sure to enjoy fresh quality food and drinks with your partner, as your children have fun on the playground.